My former boss, Secretary of State George Shultz, used to say when an administration didn't have a policy on a certain issue, the temptation always grew to give and speech instead. 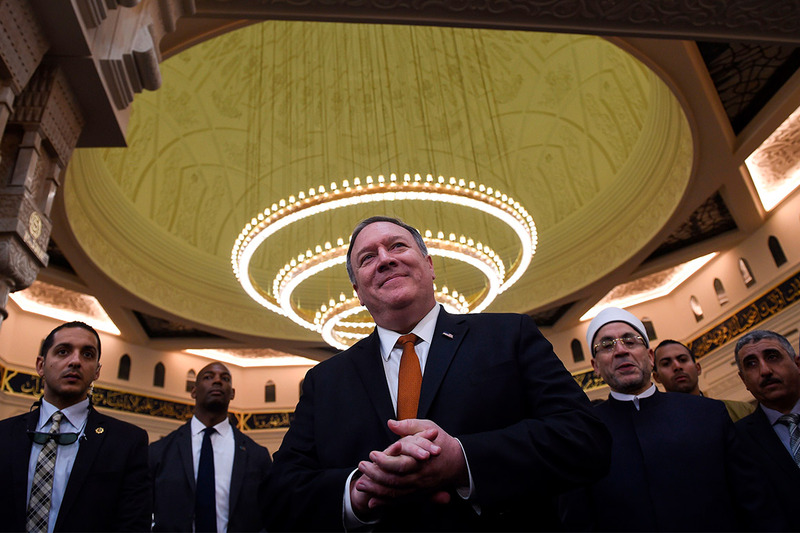 Judging by Secretary of State Mike Pompeo's sweeping Cairo speech on Thursday, apparently not the case with the Trump administration and the Middle East – though that policy is workable and effective, of course, another matter. If Pompeo's Secretary Marathon Swings Through The Arab World accomplished nothing else, it provided an unmistakable, if unrealistic, vision of US policy in the Middle East under Trump: highly moralistic, muscular and far too blac k-and-white for a region better suited to gray. It created some new tropes (the US is an undeniable "force for good" in the Middle East, Pompeo said), and falls back on some old ones (Iran is Satan's finger on Earth, and President Barack Obama's policies in the region may well have reflected the same. It was, by all accounts, a tough speech based on a vision of US power and leadership. The challenge for Pompeo is that it remains to be seen whether his foreign policy vision – assuming he even believes in it – will be in the face of a mercurial and unpredictable president whose vision is quite different, and who is much more interested in getting out of the Middle East than in getting dragged back in. Where Pompeo and Trump are undeniably in agreement is in their brutal assessment of the Obama administration. I have to say that nearly 25 years of working for half-dozen administrations — both Republican and Democratic — have never been so obsessed with defining itself against the successes and failures of another. Trump's greatest foreign policy nemesis and Obama is his home at home. In a sense, Pompeo's address represented the end of Obama's "new beginning." "Remember: It was here, another American stood before you," said Pompeo, referring to Obama. "He told you that Islamist terrorism does not stem from ideology. He told you 9/11 led my country to abandon its ideals, particularly in the Middle East. ”The secretary went to Obama for just about everything — from grossly underestimating the tenacity and viciousness of radical Islamism, to remaining silent while the Iranian people rose up in 2009's nascent green revolution, standing at silently while Syria's Bashar Assad gassed his own people. The secretary complimented his host, Egyptian President Abdel Fattah al-Sisi, on his efforts to "unleash the creative energy of Egypt's people, unfetter the economy, and to promote free and open exchange of ideas," and on the acquittal. whether Americans wrongly convicted or improperly operating NGOs in the country. Egypt's estimated 60,000 political prisoners went unmentioned, and there was no mention of reform anywhere in the Arab world. Pompeo has clearly internalized Trump's "what happens in Vegas stays in Vegas" rule when it comes to criticizing the strongmen with whom he feels comfortable. With rare exception, human rights have never been at the top of any administration's foreign policy. But as Pompeo's speech made clear, the Trump administration has emptied the frame of America's foreign policy of any ethical or moral considerations. What is so remarkable about the Pompeo speech — even though secretaries of state often get carried away with the power of their own words — Pompeo's ambitious goals were set in an administration led by a president whose instincts and actions appear to be taking the US to the exits. Listening to Pompeo, one might be forgiven for thinking that America's influence was rising, not declining, in the region, that the U.S. was poised for engagement, and that Iran, Turkey and Russia are playing enhanced roles with newfound leverage. "When America retreats, chaos follows," Pompeo exclaimed. “Let me be clear: America will not retreat until the terror fight is over.” Pompeo went on to say that in Syria, the U.S. Iran may think it owns Lebanon, "Iran is wrong;" and in Iraq, "the United States will help our partners build a nation free of Iranian influence." All of these notions would represent fantasy objectives even for the most skilled and committed administration led by a risk-ready president. But America doesn't have one of those. Pompeo's words do not only fly in the face of cruel regional realities that are likely to make a mockery of his aspirations, they hang over the head of a president who has neither the patience, nor the commitment to actually achieve any of them. As with our Syria policy now through two administrations, we have allowed our rhetoric to exceed our capacity to act, and what falls into the gap between the two is American credibility. The Trump administration is to be commended for accelerating the job of dismantling the ISIS protocol, and America remains generous with its humanitarian assistance. But unlike his closest advisers who walk back and clean up after Trump's risk-averse instincts and impulsive decision-making, the president seems to intuitively understand that the Middle East is a trap for America — a broken, angry dysfunctional region, not a country or opportunity. And instead of looking for problems to solve or dragons to slay, Trump is trying to find the exit sign. Pompeo's words notwithstanding, given the past decade and a half, who could blame him? Aaron David Miller is vice president of new initiatives and a distinguished scholar at the Wilson Center, and the author of The End of Greatness: Why America Can't Have (and Doesn't Want) Another Great President .